Alan Greenspan spends all of his spare time on the road promoting his books and defending his legacy as head of the Federal Reserve. With the housing bubble being identified more and more frequently as the source of all of America's economic woes, some analysts have begun to point their fingers at Greenspan. The old man claims, of course, that he is innocent. In an article published inThe Wall Street Journal, Greenspan accuses Stanford University Professor John Taylor of distorting the Fed's record, writing that "Aside from the inappropriate use of short-term rates to explain the value of long-term assets, his statistical indictment of Federal Reserve policy in the period 2003-2005 fails to address the aforementioned extraordinary structural developments in the global economy." In plain English, it would appear that Greenspan is arguing that because people buy homes that have 30-year mortgages and that they often own them for decades, low short-term interest rates should not push up the purchase of houses. It is a silly line of reasoning. Low interest rates help drive up the purchase of everything from video games to clothing to cars. Whether an asset holds value for years or weeks, inexpensive access to capital makes the consumer giddy and helps fuel inappropriate financial behavior. 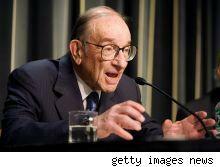 Greenspan may mount a spirited defense of his legacy, but a lot of experts won't buy it.